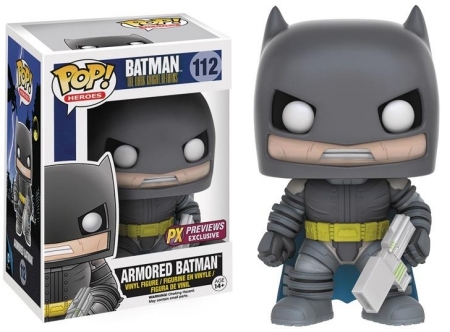 Bruce Wayne may never retire because he's…The Batman, which, incidentally, works out quite well for the Funko Pop Batman Dark Knight Returns figures. Depicting characters from Frank Miller’s The Dark Knight Returns, the set accurately details an aged Batman from the 1986 comic book series. 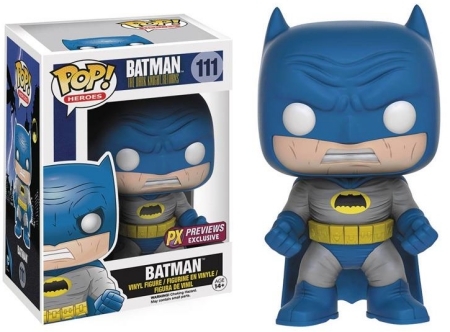 With a few different versions of the Caped Crusader, Funko Pop Batman: The Dark Knight Returns features a grimacing Batman wearing a blue suit, and of course, another figure in a black suit. 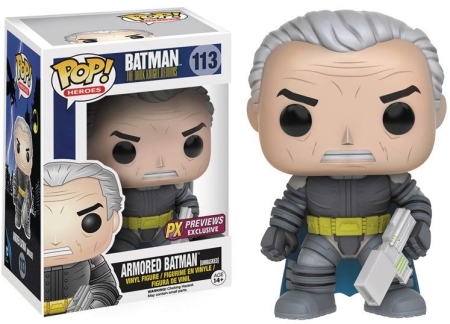 In addition, Armored Batman still has his trusty yellow utility belt and stands with a gun in hand, while the Armored Batman Unmasked version reveals a silver-haired man who has clearly not softened with age. Order Pop Dark Knight Returns Figures on Entertainment Earth. Furthering the Pop! 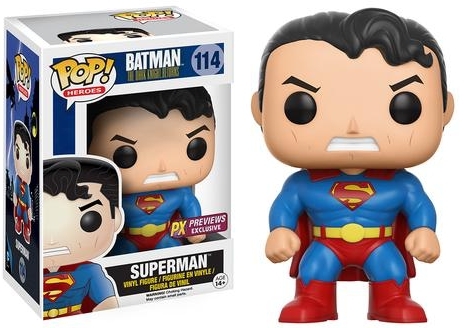 Heroes list is Batman’s frenemy and fellow caped hero, Superman. 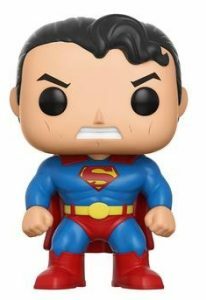 Dressed in his classic garb, Superman stands scowling and ready to fight, but with perfectly coiffed hair. The four-book miniseries also introduced a new sidekick, and this time a female would take on the Robin name and role. 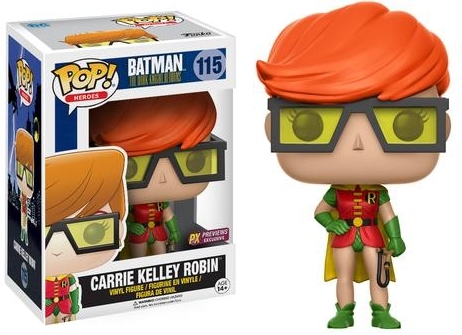 Carrie Kelley Robin rocks the iconic colors sans mask and instead wears special glasses with yellow lenses. 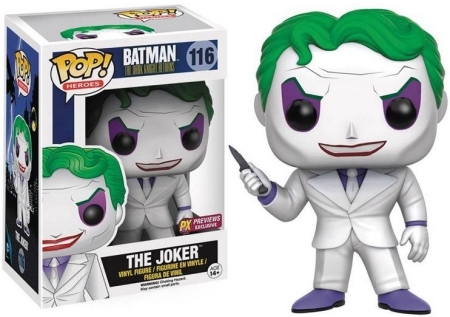 Last, but certainly not least, The Joker brings some style to the Funko Pop Batman Dark Knight Returns lineup. This fantastically bizarre version shows Joker with a white painted face that matches his suit and contrasts well with his green hair and purple eyeshadow. Oh, and he holds a small knife that somehow makes him even scarier. 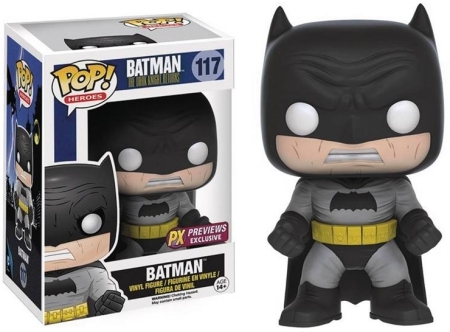 Making the search a little more involved, each Funko Pop Batman Dark Knight Returns figure is part of the PX Previews Exclusive program. Check out more information with our other Funko guides related to Batman: The Dark Knight Returns.